Was the Early Moon Made of Magma 'Mush'? LONDON — The young moon may have been a magma "mush" for hundreds of millions of years before it solidified, a scientist says. 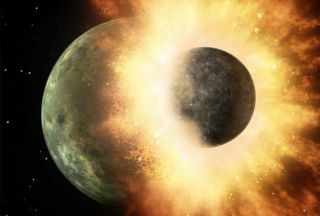 The idea, presented at a recent Royal Society conference focusing on the origin of the moon, is drastically different from the most widely accepted lunar formation model, which states that the moon was completely molten right after its accretion, 4.5 billion years ago. The magma ocean theory is based on the very first studies of the rocks that NASA's Apollo lunar landing missions and three Russian robotic probes scooped up at the surface of the moon. The Apollo missions returned to Earth carrying a whopping 842 pounds (382 kilograms) of rock, but all the samples were collected from a relatively small area of the moon's near side — the side that is constantly facing Earth. The rocks, therefore, are not necessarily representative of the bulk of the moon, Russell said, and thus have "always given us a biased view of what the composition of the lunar surface is really like." "The traditional view of the evolution of the moon is quite simplistic — that it was molten and then it solidified," Russell said. "But we're saying it's not really true, and that the moon was always a very complicated geological object." Armed with the most recent technologies, such as a laser ablation instrument, Russell has analyzed numerous lunar meteorites that were chipped off the lunar surface when asteroids smashed into it, possibly on both the near and far sides. "It seems that not all these rocks could have become crystallized from the same blob of molten stuff," Russell said. Within a few million years more crystals formed — minerals called anorthites, the white material now visible on the moon's surface. The relative buoyancy of these anorthites made them rise to the surface and created a crust over the whole moon, very quickly after the accretion. Up to 1.5 billion years after the formation of the moon, volcanoes erupted, producing the dark patches now seen on the moon's surface. For these volcanoes to form, the magma ocean should have already solidified — a process that should have taken tens of millions of years at the most, Russell said. But the available moon samples, mostly rocks known as anorthosites, are 4.3 billion years old, meaning that they appeared 200 million years after the moon's formation. That "doesn't make any sense, and it's a puzzle how that can be true," said Russell. "It's very hard to keep a magma ocean liquid for that long." "Rocks we see on the surface of the moon now are not products of a magma ocean, so we don't know if there was one [a magma ocean], as we don't have any rocks from that time," Russell said. "But there has been a lot of volcanism on the moon, a lot of messing about of the rocks — and maybe extensive volcanism that was overlaying more volcanism could have been responsible for forming some of these anorthosites." Instead of being completely molten, Russell said, the moon probably was active and hot, with "things happening" for a lot longer than currently thought. Instead of an ocean, there was a magma mush — a mixture of semisolid and liquid — with a solid crust, Russell said. The interior stayed hot, she said, making volcanoes continuously spurt onto the surface for 200 million years, with the next volcanic eruption overlaying the last one. In 2011, U.S. scientists Richard Carson and Lars Borg published a paper in the journal Nature, arguing that "the moon was either young or it didn't have a magma ocean." They stated that, based on the rock analyses and the fact that a lot of lunar anorthosites are about 4.3 billion years old, the moon may have formed much later than scientists previously thought. But that argument doesn't mesh well with a lot of other evidence, Russell said. For example, the oldest rocks on Earth are older than 4.3 billion years, and "you can't have a giant impact happening quite late in time, because the Earth is already forming rocks that we still see today". Not everyone is ready to give up the 40-year-old magma ocean theory, though. "Certainly it looks like the formation of the lunar crust was more complex than once thought," said Ian Crawford, a professor of planetary science and astrobiology at Birkbeck College, University of London. "But it is too soon to ditch the magma ocean hypothesis, as it explains a lot." More research is necessary, especially on the far side of the moon, Crawford added. Although researchers do have quite a lot of lunar meteorites — many of which are probably from the far side of the moon — studying them presents a series of problems. For one, it is impossible to know the precise locations where the lunar meteorites originated, Crawford said. Also, scientists might not be able to properly identify the composition of meteorites ejected from the moon because they could melt with other material. Finally, while they were on Earth, the meteorites may have been contaminated with Earth materials, usually for thousands of years, before being discovered. The best way to solve these mysteries would be to send another sample return mission to the moon, said Crawford.